Im new in town and hang out at the Bohemian Coffee house. I saw you will be playing there on Wednesday. I like your music/style. I will try to catch the show but will probably be out chasing money. Can I be in your back up band? I play guitar and want to get out from behind the computer and do some live stuff. I don’t really need a house band, but you are welcome to come play with me. The show is building momentum and every week, we get some new performers. Stop through anytime! That article was so inspiring Ms. QueenEarth! Thanks for sharing. I truly can relate some of your experiences. I’m still searching and trying to make it on this journey of establishing myself. Had the pleasure of listening to you at the Druid Hill Farmers Market on 7/17/13. I was very impressed of your smooth tone and guitar playing. I did buy your most recent CD….listening now. Will let you know what I think (smile). Love, Laugh and Dance…..in your case Live, Love, Laugh and Sing. Been reading your blog, inspired. I hope you do make it happen! I know you will, but also hear that disconnection of being away from Baltimore. It’s true none of us are really solo, we need our networks. I’m gonna read more soon when have time. Also, couldn’t play the sound yet on this computer–but will listen to your work soon~!! So, I was home in Baltimore for three weeks. I got a chance to glance at your notes . . . yeah . . . we definitely need to talk 🙂 I’ll be responding this week. I’m transitioning into a break from social media. TTYS! I saw you play a few songs at Takoma Park Folk Festival & spoke to you briefly afterwards. You are an amazing performer and clearly such a thoughtful person, and I’ve been enjoying poking around your website. My partner and I just bought a house by Lake Montebello and if you’re willing I’d love to have you for a house concert sometime when we’re done fixing it up. Hey. I’d love to talk to you about some Fall house concerts. I am more settled in the area, local, and I love hanging out in Waverly. A house concert would be great for me and my band. Let me know if you’re still interested. QueenEarth@queenearth.com. 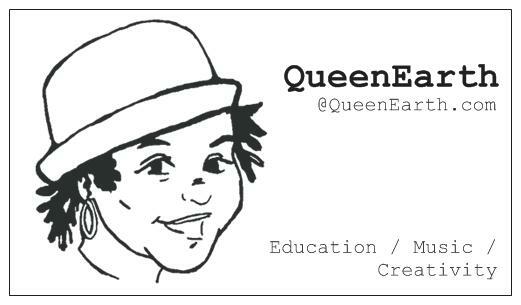 I have more music at msqueenearth.bandcamp.com. I hope we can reconnect. Hi Melissa.You have a lovely voice.If you ever need original songs to record,check out my site.My site is not only pop.I also have acoustic ballads that could suit you.Thank you. If you are still interested in a collaboration, let me know. QueenEarth@queenearth.com. I’d love to work with some new artists. I enjoyed your music so much this weekend at the Notre Dame Reunion Weekend Crab Feast. My friends and I were the losers at then end who wouldn’t leave until you sang that very last song. It was such a great show and I enjoyed every single song. Notre Dame was, hands down, our favorite gig to date. I’m glad you all enjoyed it. And thank you for sticking around til the end!